Before you visit, it is important you know your insurance benefits. The information we receive from your insurance is not always as accurate and updated as you can receive in regards to your benefit coverage. 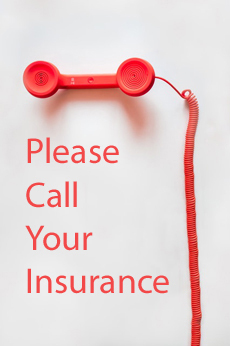 We strongly suggest that our patients contact their insurance provider’s member services department before coming to the office for their first appointment. Be clear on what your individual plan covers before you visit. 2. The contact phone number on the front or back of your card. 3. Policy holder’s name and date of birth. 4. Prospective patient's name and date of birth. 5. Our identifiers: Roberto Di Nicolo, M.D./The Asthma, Allegy and Sinus Clinic. Confirm that we are "in network" with your insurance plan. Check what services are subject to your deductible and what services are not subject to your deductible. Confirm how much of your deductible you have already met and not met for the current year. In Network: The Hospitals, Labs, physicians and other health care providers accepting a contract with your health insurance company to provide health care services. Deductible: The amount you pay for covered health care services before your insurance plan starts to pay. With a $3,000 deductible, for example, you pay the first $3,000 of covered services yourself. Co-insurance: The amount you pay to share the cost of covered services after your deductible has been paid. The co-insurance rate is usually a percentage. For example, if your co-insurance is 20%, your insurance company pays 80% of the claim, you pay 20%. Co-payment: One other term used by insurers to indicate your share of medical costs. In the case of a co-pay or co-payment, You pay a flat fee for certain medical expenses (e.g., $30 for every visit to the doctor), while your insurance company pays the rest. Maximum Out-of-pocket: The most money you will pay during a year for coverage. It includes deductibles, co-payments, and co-insurance, but is in addition to your regular insurance premiums. Beyond this amount, the insurance company will pay all expenses for the remainder of the year. In some instances co-pays and co-insurance are not mutually exclusive.